Smiling is good for mental and physical health Look after your mouth and lips with simple, natural, home made, herbal oral care. Our scalp is one of the most important parts that we tend to overlook. It’s easy to forget if you’ve got a healthy scalp, but for those with common scalp issues, it’s an on-going concern. 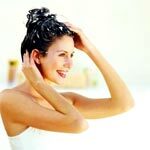 Scalp problems include dandruff, dry scalp, oily scalp, scalp acne and hair loss.